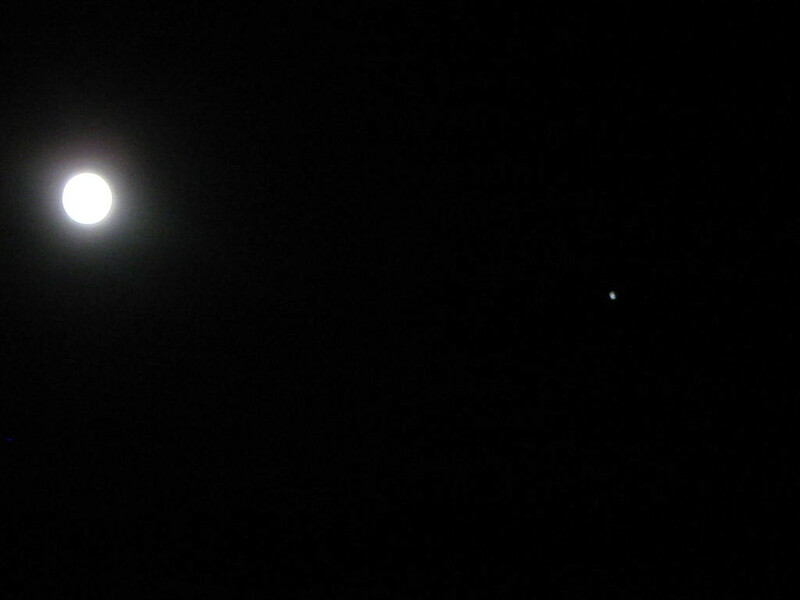 Our Moon and Jupiter are best buddies tonight. They’ll be pretty close for the next few nights as well, if you don’t remember to look up tonight. Jupiter has been an especially big and fat and bright dot in the sky lately. Since it’s roughly at the opposite side of the sky to the Sun, that puts it roughly as close to the Earth as it ever gets. I forget the exact date of the official alignment, but since I’m pretty much a naked eye, city sky stargazer, I’m not going to be too exacting. In fact, I’m going to be downright amazed that I can pick up Jupiter in the same frame as the Moon in my little old Canon digital camera. Now go look with your eyes.